During my entire career as a writer, editor and creative director, I have rented all kinds of things: cars and all sorts of location vehicles, of course, a gorilla suit for a comedian's promotion and even a taxidermy beaver (and a raccoon and a wolf and a bear!) for a Maxim magazine fashion shoot. But I had never rented a throne until a few years ago when I was charged with realizing a "Rock Royalty" concept showcasing the brand's sparkly jewelry to fashion editors. 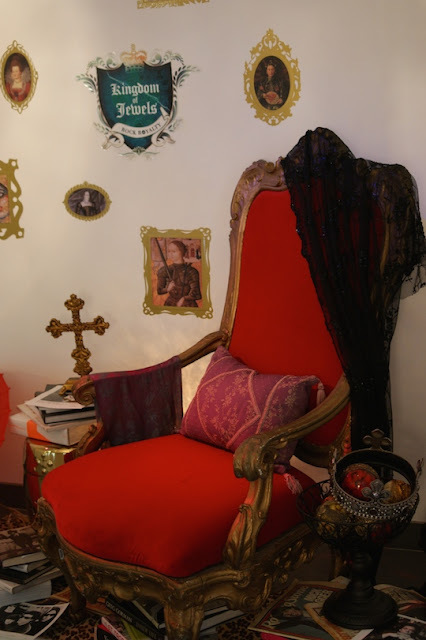 Not only did the throne become a focal point in the Swarovski entry, but it also instantly set the tone for the event and became a favorite place for guests to stop and take a photo and channel an inner queen or king. After establishing the theme, the other elements naturally fell into place, such as the crown that came from the Swarovski archives. To play up the rock 'n' roll aspect of this assignment, I scoured vintage sources for old press photos, magazines and vinyl records from the '80s. Granted, I took some creative liberties. 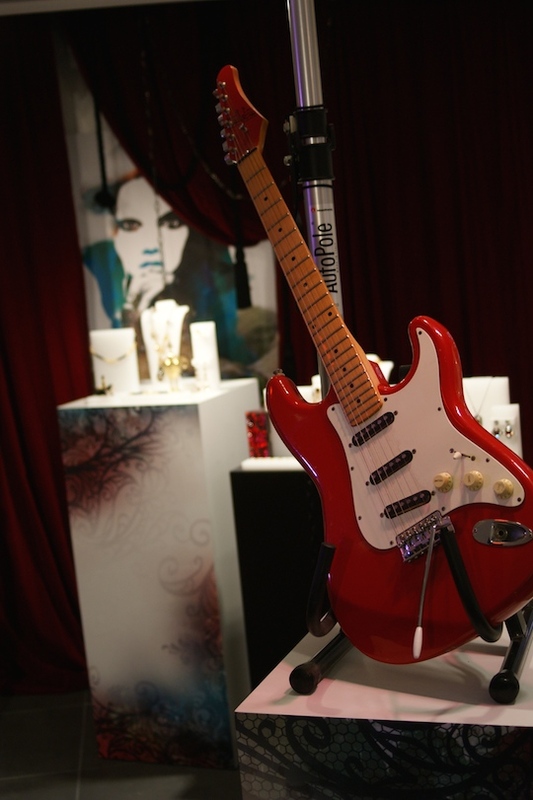 Most people wouldn't consider Madonna a rocker, but she certainly is musical royalty. And as for the made-to-order chopsticks, don't all rock stars eat sushi? The face of Swarovski for that season was former bond girl Bérénice Marlohe, and she got the royal treatment with custom frames created by the family-run Polyplastic Forms, Inc. in Farmingdale, N.Y., which has been making innovative materials for visual displays since 1940. The talented people there also made the laminates of historic royal figures that also decorate the corridor and entry area. What would an event celebrating rock 'n' roll be without a few guitars incorporated into the display scheme to further enforce the idea of "Rock Royalty." Just like an enticing tablescape, the jewelry displays in the main showroom needed something exciting to direct the eye through the space. Michael Quinn, my creative partner for this entire production, dreamed up and executed this attitude-packed trio of Rootstein mannequins as the centerpiece to do just that. 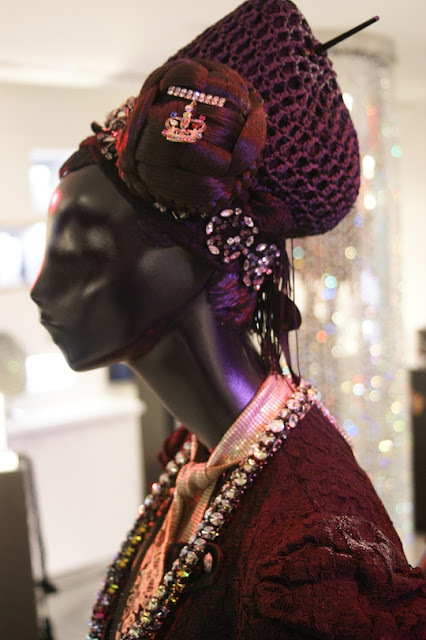 Dressed in vintage and thrift apparel and accented with bold jewelry from the Swarovski archives, this moody masterpiece brought the entire spectacle to life. 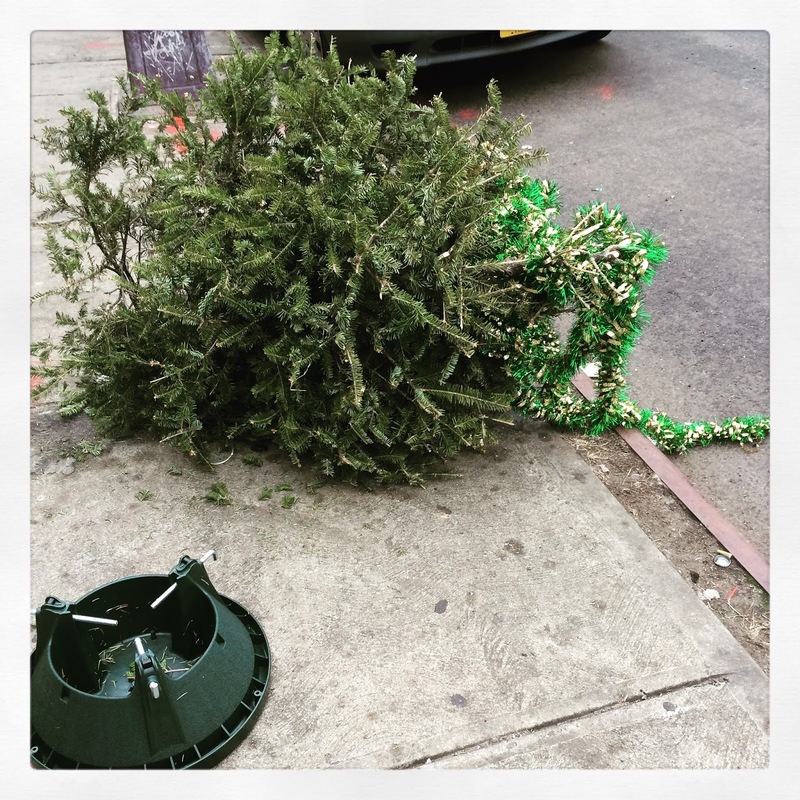 If you've ever visited New York City after Christmas, you know it is the land of crispy, crunchy, needle-dropping pine trees stacked along the side of the road waiting to be picked up and, hopefully, mulched.But having lived here for many years, I know that's most likely not the case. Instead, they'll be tossed into a garbage trunk with all the stinky detritus that New Yorkers rid themselves of every day. I don't let the reminders of a holiday gone by bother me too much, but the dead trees do make me a little sad, except for the other day. As I made my way across Eighth Street in the Village, passed a tree hat should have been thrown out two weeks ago -- maybe even three. The owner must have been in such a rush to get it out the door that in his or her haste, a tiny ornament was left hanging among remnants of golden tinsel on a brownish and brittle, fire-hazard of a branch. 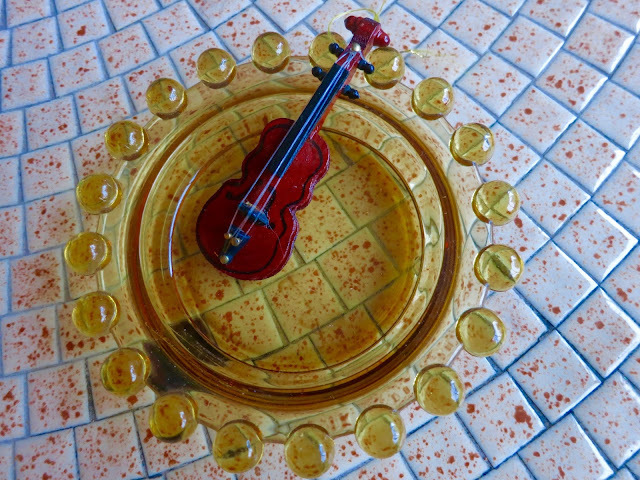 At first I didn't recognize its form, but as I leaned down, I realized it was a miniature violin, reminding me of when I played the stringed instrument in high school. I quickly reached down and plucked the treasure from where it hung, dropped dropped in my coat pocket and took it home to maybe hang it on next year's tree or enjoy it on my coffee table all year round. Thanks for letting me string you along!